Scholastic UK is building its younger fiction in order to replicate its strength in the Young Adult market. Publishing and commercial director Lisa Edwards said: "We have a big footprint in the teen market with series like The Hunger Games (Suzanne Collins) and authors such as Maggie Stiefvater. Now we want to do the same for younger readers. We have been acquiring younger fiction books all summer to underpin this part of our list," she added. The publisher is focusing on humour including titles such as Liz Pichon's Tom Gates, and series like Dave Pilkins' Captain Underpants and Terry Deary's Horrible Histories. It has acquired Ghost Buddy, a new series by Henry Winkler ("Happy Days"' The Fonz), about a boy who has a ghost as a friend. The series will launch in June 2012. The first new Captain Underpants book for four years will also be published next summer. 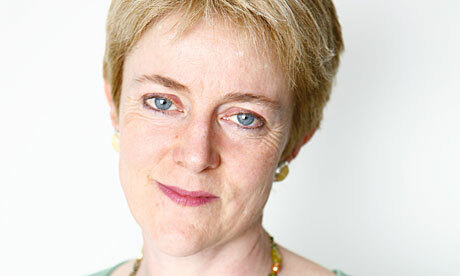 Scholastic plans to build on the current zeitgeist for illustrated fiction for readers aged eight plus, said Edwards. Hodder Children's Books has announced that Ellen Holgate (previously of Walker Books) has been appointed as Senior Editor Fiction. Reporting to Publishing Director, Anne McNeil, Ellen will work alongside the existing editorial team to develop the list, which already includes Cressida Cowell, Robert Muchamore, Hilary McKay and David Almond. Hodder have signalled that Ellen will also be commissioning new authors to their well-established fiction list. "In Croatia, they grow sunflowers commercially in great fields," she says to me, much later. "If one sunflower grows taller than the rest, it's cut down because it will take the light away from its neighbours. That's how it is in small communities. You've got to keep the same height as the rest of the sunflowers. I try to keep a low profile on the island." Kenneth Stewart is the last of the old Lairds of Coll, one of the loveliest of all the Hebridean islands. In this book Mairi Hedderwick, one of the island's best known inhabitants who has also known the laird since her first visit to the island more than fifty years ago, explores the laird's lifelong connection with Coll. The love of both for the island and its people shine through in these entrancing recollections. They reveal both the beauty of the island as well as the harshness of island life and the incredible story of how the laird inherited an estate burdened with debt, spending his life trying to rebuild a livelihood from it. Scottish Book Trust has announced that it will gift a free book to every P1 child in Scotland this November as part of its Bookbug book gifting programme, an early year's initiative that aims to give every child in Scotland a lifelong love of books. 60,000 copies of What the Ladybird Heard by Julia Donaldson, winner of the 2010 Scottish Children's Book Awards, have been distributed to classrooms around the country, ready to be gifted to children this week. 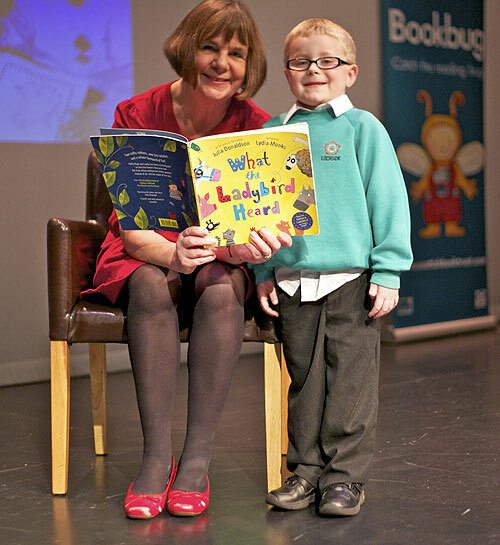 Julia Donaldson and Dillon Ryan (5) from Lochside primary School in Angus, celebrate the gifting of Julia's award-winning book, What the Ladybird Heard, to every P1 child in Scotland, through Scottish Book Trust's Bookbug programme. It was also announced at the event that Julia has agreed to become patron of the Bookbug book gifting programme. Orchard Books has to announce the appointment of Rebecca Frazer to Editorial Director, Fiction. Reporting to Megan Larkin, Publishing Director, Rebecca will lead Orchard's fiction list, which encompasses the two big-selling series Rainbow Magic and Beast Quest, as well as older fiction such as the Gallagher Girls series, Holly Webb and R.J. Anderson. Rebecca was formerly head of Sourcebooks Jabberwocky in the US, and will be relocating to London in January 2012. Adapted by screenwriter John Logan (Scorsese's "The Aviator") from Brian Selznick's popular, richly illustrated children's book "The Invention of Hugo Cabret," Scorsese's new movie is a Dickensian drama about a lonely boy's quest for happiness. The film also brings to life some of the Oscar-winning director's longtime obsessions: the history of cinema and film preservation. "Hugo" simultaneously stands on its own as a drama while also being a love letter to the creation of the medium. At the annual National Book Awards Teen Press Conference (held Tuesday), middle and high school students in New York City played the role of reporters as they directed questions to the five Finalists for the National Book Award in Young People's Literature. This year, for the first time ever, the Teen Press Conference, hosted by Scholastic Inc. and emceed by young adult author and Scholastic editor David Levithan, streamed live online. Linked page includes video of the event (if you can get it to play, which I couldn't). "Horrible Histories can carry on with other people adapting the brand. We've recently launched a Horrible Histories virtual world and there's so much more massive potential for exploiting Horrible Histories which doesn't need me any more, so I can do whatever I like, which is fiction." The blog Do Authors Dream of Electric Books? (http://authorselectric.blogspot.com) brings together a variety of published UK-based authors of fiction and non-fiction for adults, teens and children. Many of these writers are now bringing back their much-missed out-of-print books as ebooks, with others publishing new titles at affordable prices. Susan Price, whose Carnegie-winner The Ghost Drum is now out for Kindle, says: "The Kindle has set authors free to publish independently and sell in a world-wide market. We want our blog to become a site that people will bookmark, and where they can go to find quality writing at great prices." Other authors for children and teenagers contributing to Authors Electric include Katherine Roberts, Pauline Fisk and Linda Newbery. Susan Price has won both the Carnegie Medal and the Guardian Children's Fiction Prize. Random House Children's Books have a series of classic children's titles republished in small retro styled hardbacks. In 1942, BB won the Carnegie Medal for his children's book Little Grey Men, a wonderful tale about the last gnomes of England and their quest to find their lost brother, Cloudberry. BB always swore that he actually saw a gnome, as a child, near the family home in Lamport, Northamptonshire, and he never lost an almost childlike mysticism. Andy Mulligan is also the author of Trash. For the first time this year, children were involved in the voting. Rosen describes it as "just like Strictly Come Dancing. Four judges sit with buns and coffee and choose the shortlist and grade them and put them in an order, with lots of shouting and ripping and stabbing and smashing cafetieres. Then the 400 children read the books on the shortlist and grade it and then the two league tables are amalgamated and the winner comes out of that amalgamation." He added that it was "wonderful to build in a children's viewpoint because you can hit a wall in the judging where too often you get into the 'would' bit - you start saying that children 'would' like it. Now we've built in children 'do' like it rather than children 'would'." Who would have thought a bear could be so credible and iconic, that some of the world's most coveted fashion designers have got aboard with BBC Children in Need to design a a unique Pudsey bear that is synonymous of their own collections. Fashion designers Erdem, Katie Hillier, Mulberry and Giles Deacon, are just a few who have submitted a creation to the collection which will be exhibited in Liberty from November 7 to 19 November 2011. The collection is being auctioned to raise money for BBC Children in Need. 60 Second Video Review - Is It A Record? The splendid David Maybury sees how many books he can review in 60 seconds! Reviews!! from David Maybury on Vimeo. iLounge, the online magazine for mobile Apple devices, has declared Nosy Crow's Cinderella its iPad Kids App of the Year as part of its 2012 Buyers' Guide, beating off stiff competition from runners-up including Dano Pirate HD from Bambino Avenue and ABC Food from Peapod Labs. Jeremy Horwitz, iLounge's Editor-in-Chief, said that, "Of all the kids' applications we've tested over the past year for iPads, Nosy Crow's Cinderella was most certainly the best. The story dates back centuries, but Nosy Crow's version feels like something entirely new, bringing the classic characters to life inside funny, surprisingly interactive 3-D environments. The charming voice work alone is good enough to justify the purchase, and as you listen, you'll discover a dozen little details that all work together to make Cinderella memorably excellent." Egmont have launched a Timmy Time App. Created in conjunction with Aardman Animations Ltd, creators of Wallace & Gromit, and Firsty Group, experts in book app development, the App features stories, colouring pages, a Timmy-style keyboard and even video clips from the TV show. It's fully interactive and touch enabled, giving children the chance to bring the Timmy Time world to life and play alongside their friends Timmy, Paxton, Yabba, Otus, and Mittens. "I never read kids books, I hated them, I sort of thought they pandered to you,' Coupland said in an interview. "Kids books in general, I think, treat kids like they're dumb. "If I had found this book when I was a kid I would've been, 'Yes! This confirms everything I thought about adulthood!' And I would've been quite happy, I think." [Coupland's new book, Highly Inapproriate Tales for Young People] is more likely to be stocked in bookstores alongside Adam Mansbach and Ricardo Cortes' "Go the (Bleep) to Sleep," than with Dr. Seuss, Robert Munsch or the "Diary of a Wimpy Kid" titles. Coupland's seven short stories feature characters like Donald the Incredibly Hostile Juice Box, who is made up of a little fruit juice and sugar but mostly evil. He lives to torment other juice boxes by stabbing their foil straw holes and spilling out their insides. If I could chart a course to rescue picture books, I'd suggest that we establish the writer again as half of the equation. We need real stories, and long stories, that can be read more than once. I, by the way, don't believe that critics change books. I believe geniuses--like Wanda Gag, Virginia Lee Burton, Robert McCloskey, Margaret Wise Brown, Maurice Sendak, Ruth Krauss, Chris Van Allsburg, and more recently Shaun Tan--reinvent the form. Someone who creates contemporary picture books is probably working right now on a title that'll revitalize our understanding of and ideas about picture books. In a deal brokered through LAIKA, who produced Academy Award-nominated animated feature Coraline, Hodder Children's Books have announced the acquisition of three PARANORMAN titles. ParaNorman is a spooky adventure for children age 9+ -- soon to be a major motion picture! In a quaint New England town with a history of witches and pilgrims, misunderstood eleven-year-old Norman Babcock can see and talk to ghosts. No one believes him, of course -- everyone just thinks he's weird (including his parents). But when a folktale of a witch who cursed her accusers turns out to be true, it's up to Norman to save the town from pilgrim zombies! In addition to the zombies, he takes on a very angry witch, an annoying side-kick, his boy-crazy teenage sister, and dozens of moronic grown-ups who get in his way. This young ghoul whisperer finds his paranormal talents pushed to their otherworldly limits! Featuring gorgeous black-and-white interior illustrations and a story beyond what you'll see in the film, this novel is sure to delight. ParaNorman is an original screenplay from director Chris Butler novelised (with illustrations) by Elizabeth Cody Kimmel, author of the popular Suddenly Supernatural series. Working closely with ParaNorman's writer/director Chris Butler, Kimmel provides an exciting expanded version of the film's story that is illustrated throughout with black-and-white illustrations. No stranger to writing about the paranormal world, Kimmel brings humour, heart, and supernatural charm to Norman's trials and tribulations that will have readers eagerly anticipating the chance to see the movie in 3D. Elizabeth Cody Kimmel lives with her family in New York's Hudson Valley. The voice cast includes Academy Award nominee Casey Affleck, Tempestt Bledsoe, Jeff Garlin, John Goodman and more! Hodder Children's Books have acquired English Language UK and Commonwealth Book Rights. "The Chronicles of Harris Burdick" features short stories based on 14 black and white illustrations originally published in "The Mysteries of Harris Burdick." In these stories, distinguished authors including Lowry, Stephen King, Louis Sachar, and Van Allsburg himself, revisit the old images and provide their own interpretations of the Burdick mystery. One of the first people... contacted was Lowry, author of "The Giver" and "Number the Stars," who agreed to write the story for "The Seven Chairs." "I had always thought that particular picture was the most fascinating," Lowry said of the image, which depicts a nun sitting on a floating chair. "I began [to write] with an element of exhilaration," she said. The process, however, came with some challenges. "I forgot about the caption," said Lowry, who was two-thirds into writing when she remembered that she needed to include the sentence "The fifth one ended up in France" somewhere in her story. "I had to figure out how to get a nun in Lowell, Massachusetts, to France very quickly."